We have our very own, Mark McCaffrey to credit for this beautiful swimming pool. Mark has extensive knowledge in complex hydrodynamics. He understands so many various ways to plumb equipment and create complicated water features that it makes our heads spin. If you are an Engineer then you will love this article! 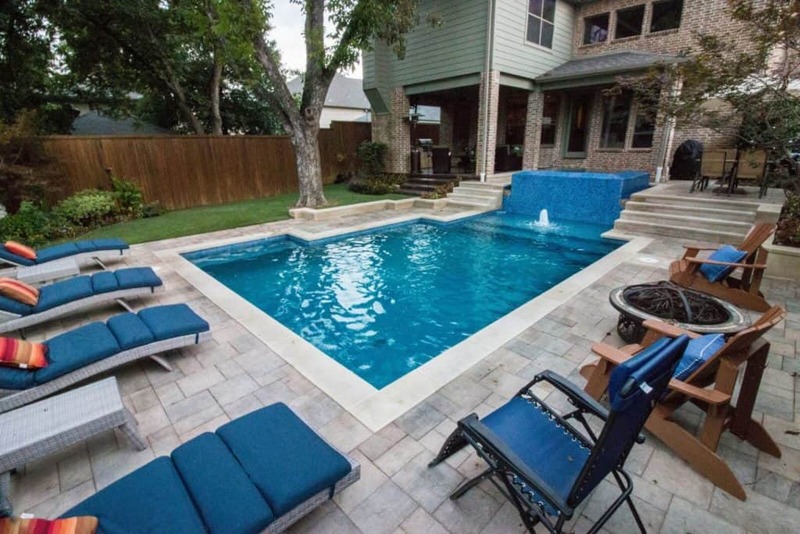 This pool includes various features that blend together to create a Negative Edge Water Fall. This water feature stretches across the raised spa and cascades down to the pool basin. A Negative Edge Waterfall requires a constant flow of water and often utilizes a larger pump to push the water. If these water features are plumbed incorrectly or enough water flow is not obtained then it completely ruins the look. For the Busbee job, we utilized a Pentair Intelliflo VS Pump. These pumps are unique because they can be programmed to reach various RPM‘s (rotations per minute) or GPM (gallons per minute). This helps us achieve a wide range of water flows to pull off complex water features. Now that we have the capability of nailing down the exact RPM on our water features – the real trick of the trade is calculating what each water feature requires. This is where Mark comes in. He has over 30 years in the industry and can tell you how much water a negative edge requires from his extensive knowledge a sharp pencil. We’ve led our math nerds on long enough. We’re sure you were wondering so we will go ahead and tell you: our negative edge spa required exactly 80 Gallons per Minute. Enough math talk – let’s get down to some of our design work for this pool. We created our raised spa utilizing 1/2″ rebar on 10″ centers. 10″ refers to the width of the grid pattern of our steel. For raised pool sections we use tighter grid patterns in order to increase its strength. We used this steel framework to create the shape of our raised spa and called in the Shotcrete crews to do the rest. Shotcrete crews are more expensive and we’ve used ours for years. They understand our way of building a pool and provide us ample support to create strong structures for our customers. For our tile, we used Master Tile # 1191. This is a 1″ tile that requires being set with a high-grade flexible mortar system. Despite its immense beauty, this spa only required a day and a half for our crews to complete. It’s fast work but very technical and we use only the best subcontractors who understand our demand for perfection. The end result is a beautiful raised spa sure to provide years of enjoyment, comfort, and beauty for family and guests. What a gorgeous deck! It looks like a french cut travertine deck (natural stone) but it’s technically concrete. No, we didn’t pour this on the job site, although we would like to brag and take credit. Instead, we sourced this beautiful decking from a manufacturer called Belgard. Belgard is a unique product category because it is concrete slabs manufactured in a factory. These pavers are massed produced and only authorized for shipment if they meet the Belgard high-quality standards. This specific color selection is the Latiff Grana Slab Pavers. If you would like to see more colors and styles, click this link to view their entire catalog. Sum It All Up – You’ve Got a New Pool! This is just scratching the surface of what we do here every day at Summerhill Pools. We are proud of the high-quality name we support and it’s a brand that we are continuously fine-tuning and improving. If you would like to view more of our completed swimming pools and learn more about Summerhill Pools, we invite you to check out many of our other articles listed below or contact us today!